Few bands in popular music can lay claim to inventing one genre let alone two, but that’s exactly the legacy The Byrds proudly justify with even a cursory glance through their back pages. Unsurprisingly given this double boast it’s possible to see them as two bands. The former lasted for an incredible run of five albums from 1965-1968. The early line up, featuring the varying talents of Roger McGuinn, David Crosby, Chris Hillman, Michael Clarke and initially Gene Clarke, virtually built the template for indie rock with their chiming, jangly sound that could be heard a generation later in the likes of REM and The Smiths. Watch Johnny Marr on Top of the Pops tossing his fringe and picking a 12 string Rickenbacker and the influence on thousands of polo necked guitar slingers is overt. 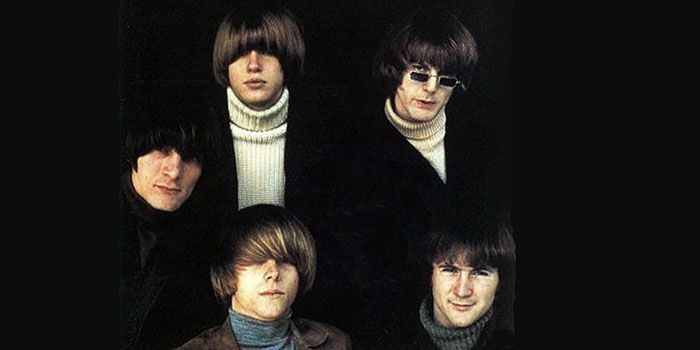 From then on the Byrds became an arguably more interesting if fractious group defined by the stellar talents of Gram Parsons and the country rock masterpiece Sweetheart of the Rodeo which simultaneously birthed the early 70s sound of the Eagles and the now ubiquitous alt-country nu-folk of Ryan Adams, Wilco and Fleet Foxes. Ahead of Roger McGuinn‘s show at the Capstone Theatre on November 8, we take a look at ten of the best from The Byrds‘ treasure trove. Not just top of this list but in with a shout at being the greatest song of all time, this 1966 masterpiece was as revolutionary as anything recorded in that special year. Arguably the first song to introduce the concept of psychedelia into popular music with its hypnotic drone influenced by jazz maestro John Coltrane and sitar master Ravi Shankar. Add in a lyric so trippy and you have one of the defining moments of drug-influenced rock. Gram Parsons spent less than a year with the Byrds but by the end of 1968 he had almost single-handedly transformed the band to reflect his desire to create ‘Cosmic American Music’ – a hybrid of country, RnB, soul, folk and rock. 100 Years From Now was his stand out contribution to the seminal Sweetheart of the Rodeo. No one covered Bob Dylan quite like The Byrds but after covering six of his songs on their first two albums, they needed something special for the seventh amid threats from Crosby they were becoming “formulaic”. Thankfully in My Back Pages they produced a beautifully reflective take on Dylan’s world weary rejection of the protest moment. Ask the man on the street to name one Byrds song and it would probably be this. Taking Dylan’s rambling original, McGuinn and co condense it into one glorious mass of harmonies, 12-string guitar and one of the most distinctively memorable intros in pop history. McGuinn later said the song was a “prayer of submission to God“. I imagine God obliged. While their best known for the Dylan covers, the Byrds had a special relationship with songwriters Goffin and King who originally offered this song to Dusty Springfield in 1966. Dusty’s sublime version is hard to top but the Byrd’s male spin on the song’s lament for lost childhood innocence adds a heartbreaking sense of post-summer of love sadness to proceedings. Crosby hated it, dismissing the song as lightweight fluff. He’s wrong. The Byrd’s poppiest moment was tucked away on the b-side of All I Really Want To Do and showcased both Gene Clarke’s incredible song writing abilities and his warm, country-tinged vocals. So much of what made the early Byrds great is crystalised in the song from McGuinn, Clarke and Crosby’s complex harmonies to McGuinn’s jangle. The use of the word ‘probably’ still stands out giving the song a whole new subtext beyond the usual boy meets girl platitudes of pre-Beatles pop. Another Dylan song, another triumph. The lead track on Sweetheart of the Rodeo, it ushered in the band’s new country rock sound and showed what a goldmine Dylan’s Basement Tapes would prove to be for those seeking the more obscure. The group’s final mainstream hit but what a way to go. Possibly even more psychedelic than Eight Miles High, 5D (Fifth Dimension) is a virtual advocacy of LSD with added kaleidoscopic keyboards supplied by Brian Wilson cohort Van Dyke Parks. McGuinn described the song as “an ethereal trip into metaphysics, into an almost Moslem submission to an Allah, an almighty spirit, free-floating, the fifth dimension being the ‘mesh’ which Einstein theorized about.” Who am I to argue? Written as early as 1963, by McGuinn and Gene Clarke, You Showed Me’s strange mix of major and minor chords was quickly jettisoned by the Byrds before becoming a huge hit in 1968 for The Turtles and again in 1997 for the Lightning Seeds. It’s also been sampled by De La Soul and Kanye West.